London in April, 1940, is a place of great fear and conflict. The Germans have taken Poland, France, Holland, Belgium, and Czechoslovakia. The Nazi war machine now menaces Britain, even as America remains uncommitted to providing military aid. Should Britain negotiate with Germany? The members of the War Cabinet bicker, yell, and are divided. Churchill, leading the faction to fight, and Lord Halifax, cautioning that prudence is the way to survive, attempt to usurp one another by any means possible. In Never Surrender, we feel we are alongside these complex and imperfect men, determining the fate of the British Empire, and perhaps, the world. Drawing on the War Cabinet papers, other government documents, private diaries, newspaper accounts, and memoirs, historian John Kelly tells the story of the summer of 1940. Kelly takes readers from the battlefield to Parliament, to the government ministries, to the British high command, to the desperate Anglo-French conference in Paris and London, to the American embassy in London, and to life with the ordinary Britons. We see Churchill seize the historical moment and ultimately inspire his government, military, and people to fight. Kelly brings to life one of the most heroic moments of the twentieth century and intimately portrays some of its largest players—Churchill, Lord Halifax, Hitler, FDR, Joe Kennedy, and others. 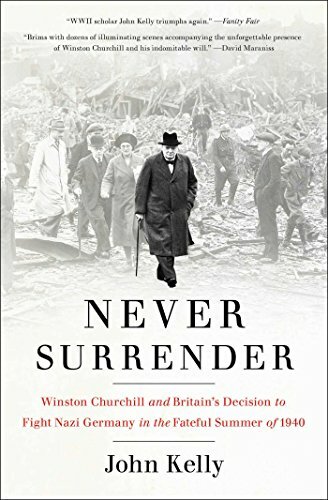 Never Surrender is a fabulous, grand narrative of a crucial period in World War II and the men and women who shaped it. “For lovers of minute-by-minute history, it’s a feast” (Huffington Post).